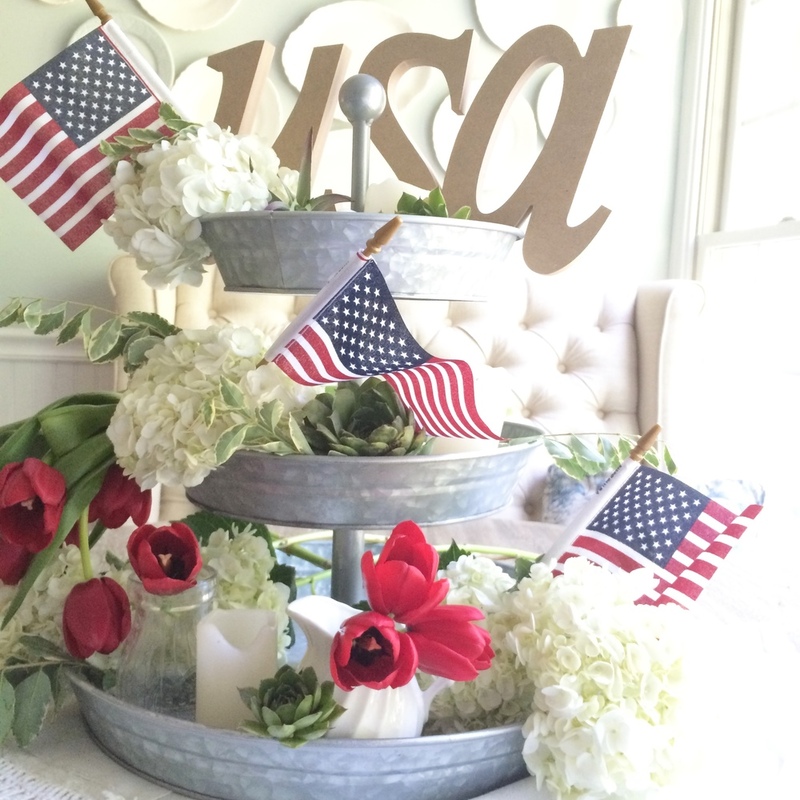 Here is a complete DIY tutorial on how to re-create my 4th of July 3-teir tray centerpiece. Follow these steps to create your own centerpiece that will add a designers touch to your 4th of July get togethers and cookouts. 1. Start with a blank tray. I purchased my 3-teir galvanized tray from World Market. Fresh flowers- Hydrangeas, Tulips, Baby's Breath- Etc. 3. First place your Hydrangeas. I placed them first because they are the bulk filler- largest flower. I placed four blooms on the bottom tier, one on the second tier, and one on the top. Don't get too tedious with this step because you will rearrange as you add more fillers. 4. Add the tulips. I left the tulips with their long stems and placed them on the second tier behind the hydrangea. I let them cascade and fall down into the first tier. I left 5 tulips out for adding color to the other two tiers. 5. Add the flags. Place the wooden poles down into your hydrangeas. 5. Add the small fillers- candles, pitcher, vase, and left over tulips. I placed two different sized candles on the top tier, one on the second tier, and one on the bottom tier. I also placed the white ironstone pitcher on the bottom tier and filled it with 3 tulip stems. I then placed the small milk bottle on the bottom tier and placed a single tulip inside it. This gives the bottom larger tier a more full look. 6. Add the succulents. I added succulent anywhere that needed to be "filled" in. 7. Add greenery throughout. I got these sprigs out of my yard. Any long stem with lots of leaves will work perfectly. This just adds color and dimension to your centerpiece. 8. Top it off with a USA cutout or any patriotic piece of decor you may have. Hope this tutorial inspires you to create your very own centerpiece. Don't worry if yours doesn't turn out exactly like mine- thats the beauty in design. I hope you have a wonderful weekend and a very happy 4th of July! Here's a few more photos of my 4th of July centerpiece!